We’ve gone through crucial times as bannock is still making its way in the restaurant world. We first set up as a bannock stand in Westbank, BC, years ago. We experienced success in our little venture, and sought feedback from our customers about opening a First Nations restaurant. What is a First Nations restaurant? If you have been to a Mexican restaurant, Italian, Chinese, Japanese, Thai, etc., there are now First Nations restaurants opening up across Canada! We introduced a quick bread, called fry-bread, or as most of Canada knows it, Bannock. Bannock has long been a staple of the First Nations/Indigenous people of North America. Original ingredients included roots, berries, ground corn, and Saskatoon berries, to make a dense bread. Thanks to modern advances in wheat processing, Kekuli is able to create a bannock that is soft, light, fluffy, and deep-fried in 100% canola oil. Bannock texture is between that of a scone and a doughnut! It’s different, and we are able to use it as a bun for most of sandwiches and burgers on our menu! (We also offer multigrain and gluten-free bread options). Ten years in the restaurant world! For the past seven years Kekuli Cafe has been bringing Native foods to the mainstream! Since this introduction, First Nations restaurants have been popping up all across Canada. To think, back when I started researching Native restaurants the only one I found was Lillget Feast House, located on Davie Street in Vancouver, BC in the ’80s. I was so excited to see something like this, but unfortunately the restaurant didn’t stay open. The owner retired and I haven’t heard of another restaurant like that since then. Kekuli Cafe set a trend in 2004, making their way into a competitive restaurant world. It has taken 7 years to get to where we are today, perfecting a menu that suits the taste buds of many, with fresh, homemade foods. We feel it is important to bring foods from a culture that has been historically oppressed into the mainstream, to raise awareness and create opportunities in our community! We look forward to meeting you at Kekuli Cafe Coffee House! 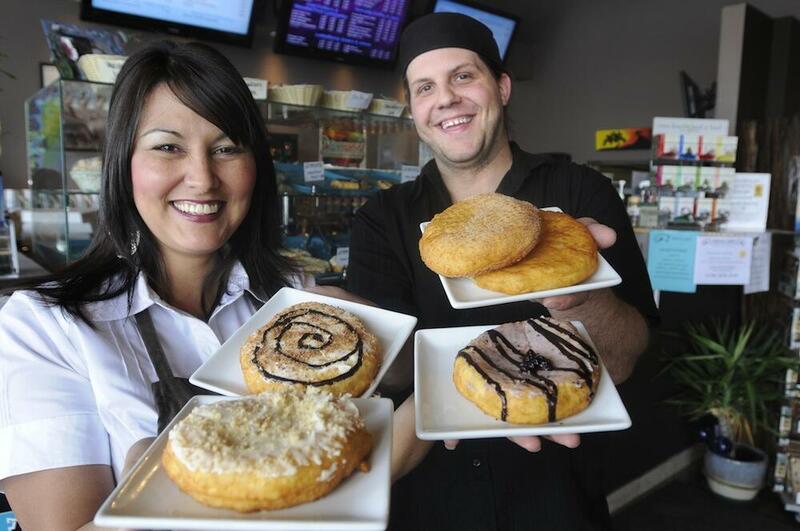 Sharon Bond of Kekuli Cafe and her Husband Darren Hogg- Keep Calm and Bannock On!